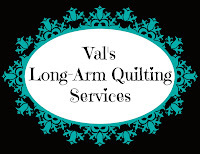 Val's Quilting Studio : Unexpected Inspiration! My friend texted me these pictures the other night of her boyfriend finishing his t-shirt quilt! I guess it took him a few hours to get the "perfect" layout. (If he only knew I leave mine on the design way for a week...or more!) He has a genuine eye for quilting as his balance of colors and design turned out "just right" if you ask me. Like most of his, he found sewing the rows together a bit tedious, yet I couldn't help but be inspired by his creativity and desire to learn something new. I hope more young people take up the hobby we all love so much. So nice to see a male quilting. I hope than more males realize that quilting is fun and creative for everyone and of all ages. Love this. About five years ago my son decided to make his girlfriend a basic patchwork quilt for Christmas. He did a great job. I wish I had taken a picture. It was a huge labor of love. I am impressed. Such a fabulous quilt! He came up with a great lay out. It's nice to see any young person showing an interest in making quilts. Good for him. Looks great!